Cell proliferation, phenotype, and frequency of T and NK cells in PBL stimulated by apoptotic tumor cell–loaded DC. (A) PBL isolated from healthy blood donors were cultured with IFN-DC or IL-4–DC (DC/PBL ratio of 1:4) pulsed with apoptotic Karpas-422 cells (DC/Apo ratio of 1:2), as described in Materials and Methods. The relative fold increase in the starting cell number was defined as proliferation index and calculated as the ratio of PBL cell count on day 14/PBL cell number on day 0. Frequencies of CD4+, CD8+, CD56+CD3−, and CD56+CD3+ cells were determined by flow cytometric analysis in PBL cocultured with apoptotic Karpas-422–loaded DC for 14 d. (B) Representative dot plot analysis (of four independent experiments) of CD56 and CD3 expression (upper panels) or CD56 and CD16 expression (lower panels) in PBL cultured for 14 d with apoptotic Karpas-422–loaded IFN-DC or IL-4–DC (see Materials and Methods) compared with PBL cultured in the absence of DC. All plots were gated on lymphocytes identified according to forward and side light scatter. (C) Relative proliferation of CD4+, CD8+, and CD56+ cell subsets by CFSE dilution assay in PBL cultured or not for 7 d with tumor cell–loaded DC. All cytometric analyses are representative of at least four experiments and were performed on electronically gated lymphocytes according to lineage-specific markers. *p ≤ 0.05, Wilcoxon test. Cytokine production and NK cell activation upon IFN-DC stimulation. (A) IFN-γ secretion detected by ELISA assay using PBL culture supernatants harvested after 3 d of culture with apoptotic Karpas-422–loaded DC (DC/PBL ratio of 1:4) compared with supernatants from PBL cultured in the absence of DC. Data are mean ± SD of five independent experiments. *p ≤ 0.05, Mann–Whitney U test. (B) Expression of the early activation marker CD69 by flow cytometric analysis in CD56+CD3− NK cells electronically gated from PBL cultured for 3 d with apoptotic tumor cell–loaded DC compared with freshly purified unstimulated PBL. Representative dot plots of four independent experiments are shown. (C) Representative dot plot analysis (of four) of IFN-γ intracellular staining in CD3+CD56− cells (upper panels) and CD56+CD3− cells (lower panels) electronically gated from PBL cultured for 3 d with apoptotic tumor cell–loaded DC compared with freshly purified unstimulated PBL. IFN-γ production by CD56+CD3− cells was also tested against NK-sensitive K562 cells by incubating PBL from 3-d cocultures with K562 cells in the presence of GolgiPlug for 4 h at 37°C (see Materials and Methods). Cells were stained for the CD3 and CD56 Ag to electronically select distinct cell subsets, fixed, permeabilized, and stained for intracellular IFN-γ before FACS analysis. (D) Production of IFN-γ, TNF-α, and IL-10 in the culture supernatants of PBL cocultured with apoptotic Karpas-422–loaded DC. The amount of cytokines was evaluated by ELISA at days 7 and 14 of cocultures. *p ≤ 0.05, Wilcoxon test. 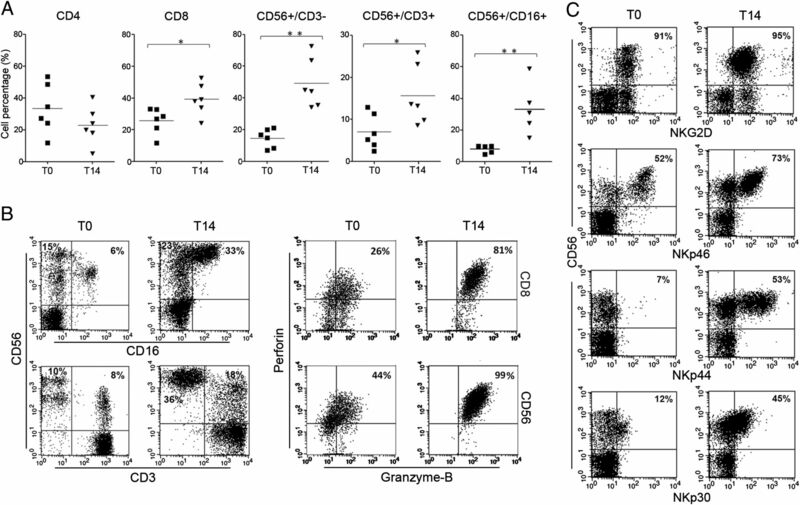 (E) Frequency of CD25+FOXP3+ Treg in CD4+ lymphocyte gate, as assessed by flow cytometric analysis of PBL from 14-d cocultures with apoptotic tumor cell–loaded DC (left panel). A representative dot plot of five independent experiments (right panel). (F) Representative examples (of five) of NKG2D, NKp46, NKp44, and NKp30 expression on CD56+ NK cells in PBL cocultured for 14 d with apoptotic Karpas-422–loaded DC. The analyses were performed on electronically gated CD56+CD3− cells. Antitumor response of NK cells stimulated by IFN-DC loaded with apoptotic Karpas-422 lymphoma cells. (A) Cytotoxic activity of PBL isolated from healthy blood donors (♦) and cultured for 14 d with apoptotic tumor cell–loaded IFN-DC (▴) or IL-4–DC (▪) tested by Calcein-AM assay (see Materials and Methods) against NK-sensitive K562 and Karpas-422 target cell lines for 4 h at 37° at different E:T ratios. Data are mean ± SD of a triplicate assay of PBL derived from an HLA-A2+ donor. 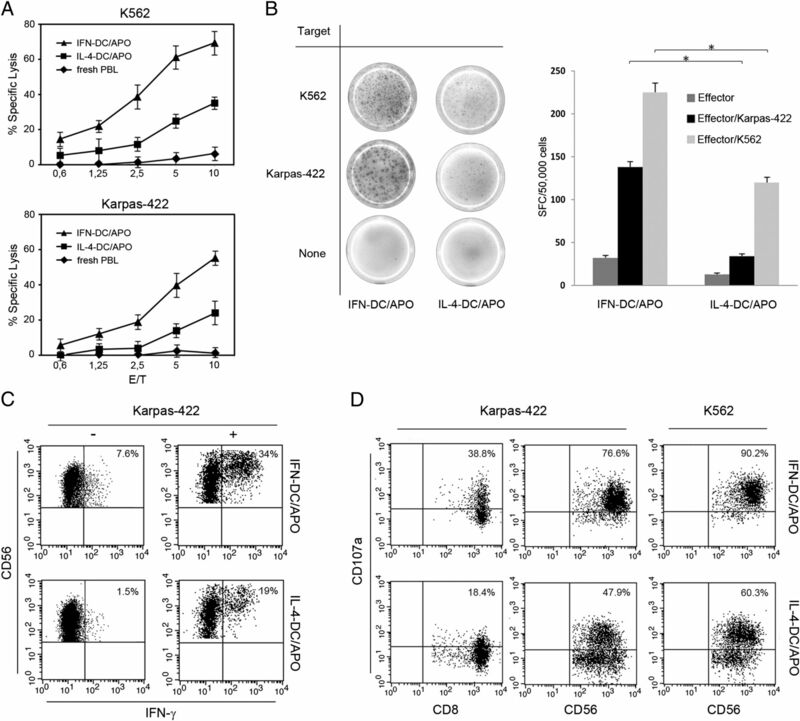 (B) Frequencies of Karpas-422– and K562-responsive lymphocytes determined by ELISPOT assay for IFN-γ production in PBL cultured for 14 d with apoptotic tumor cell–loaded IFN-DC or IL-4–DC. PBL were cultured alone (grey bar), with Karpas-422 lymphoma cells (black bar), or with NK-sensitive K562 cells (light grey bar) for 18 h (E:T ratio of 1:2) before measuring spot-forming cells for IFN-γ. The data are mean ± SD of four independent experiments. *p ≤ 0.05, Mann–Whitney U test. (C) Representative dot plot analysis (of four independent experiments) of IFN-γ intracellular staining in CD56+CD3− cells electronically gated from total PBL cultured for 14 d with apoptotic tumor cell–loaded DC. IFN-γ production was tested against Karpas-422 lymphoma cells (E:T ratio of 2:1) by restimulating PBL with target cells in the presence of GolgiPlug for 4 h at 37°C (see Materials and Methods). Cells were then stained for the CD3 and CD56 Ag, fixed, permeabilized, and stained for intracellular IFN-γ before FACS analysis. Numbers represent the percentage of NK cells responding to Karpas-422 cells with IFN-γ production. (D) Degranulation assay as a surrogate marker of cytotoxic activity of CD8+ and NK cells. Representative dot plot analysis of CD107a membrane expression on electronically gated CD8+CD3+ and CD56+CD3− cells in PBL cocultured with apoptotic tumor cell–loaded DC. On day 14, PBL were restimulated with Karpas-422 lymphoma or K562 target cell lines for 4 h at 37°C (E:T ratio of 2:1) in the presence of FITC-conjugated anti-CD107a Ab (see Materials and Methods). Dot plot shows CD107a membrane exposure on CD8+CD3+ and CD56+CD3− lymphocytes in response to the indicated target cells. The data for one representative experiment of four with similar results are shown. 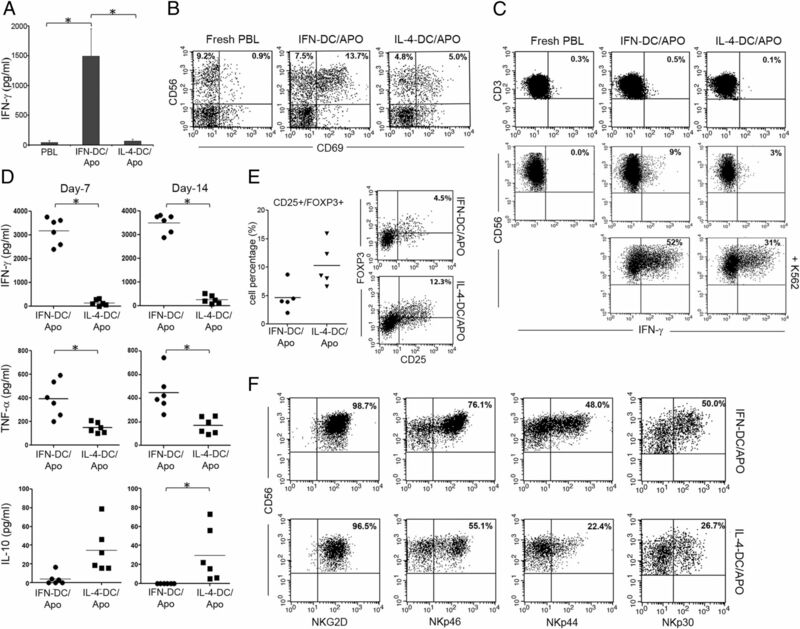 Phenotype and frequency of T and NK cells in PBL from FL patients stimulated by apoptotic lymphoma cell–loaded IFN-DC. 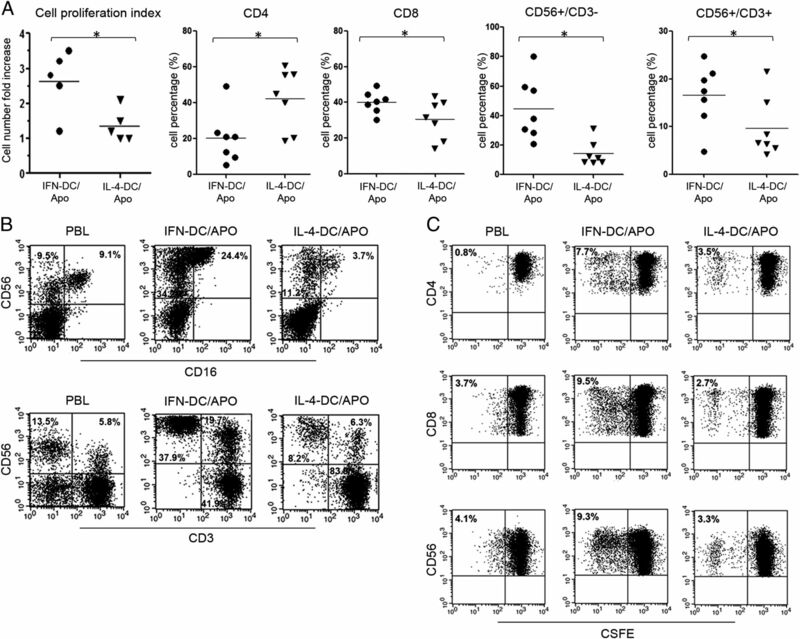 (A) Flow cytometric analysis of frequencies of CD4+, CD8+, CD56+CD3−, CD56+CD3+, or CD56+CD16+ cell subsets in freshly purified PBL from FL patients (T0) compared with PBL cocultured with autologous apoptotic lymphoma cell–loaded IFN-DC (DC/PBL ratio of 1:4) for 14 d (T14), as described in Materials and Methods. (B) Representative dot plot analysis (of six independent experiments) of CD56 and CD16 expression (upper panels) or CD56 and CD3 expression (lower panels) in freshly purified PBL from FL patients (T0) or PBL cocultured with autologous apoptotic lymphoma cell–loaded IFN-DC for 14 d (T14) (left panels). All plots were gated on lymphocytes identified according to forward and side light scatter. Perforin and granzyme B intracellular content in CD8+CD56− (upper panels) and CD56+CD8− cells (lower panels) electronically gated from patient-derived PBL after 14-d cocultures (T14) compared with fresh unstimulated PBL (T0) (right panels). Cells were stained for the CD8 and CD56 Ag, fixed, permeabilized, and stained for intracellular perforin and granzyme B before FACS analysis. Numbers represent the percentage of cytotoxic cells expressing both lytic proteins. Representative dot plots of three independent experiments are shown. (C) Representative examples (of four independent experiments) of NKG2D, NKp46, NKp44, and NKp30 expression in electronically gated CD56+CD3− lymphocytes from FL patient–derived PBL cultured with autologous apoptotic lymphoma cell–loaded IFN-DC for 14 d (T14) compared with freshly isolated PBL (T0). *p ≤ 0.05, **p ≤ 0.005, Mann–Whitney U test. Cytokine production and antitumor activity of PBL from FL patients stimulated by IFN-DC loaded with autologous apoptotic lymphoma cells. (A) PBL isolated from four FL patient blood donors were cultured with IFN-DC (DC/PBL ratio of 1:4) pulsed with autologous apoptotic lymphoma cells (DC/APO ratio of 1:2), and IFN-γ and TNF-α production in the culture supernatants was evaluated by ELISA at days 7 and 14 of cocultures. (B) PBL cocultured with apoptotic lymphoma cell–loaded IFN-DC were evaluated for IFN-γ, granzyme B, or perforin production in response to autologous lymphoma cells by ELISPOT assays. On day 14, PBL were incubated with autologous patient-derived FL cells (grey bar) or cultured alone (light grey bar) for 18 h before measuring spot-forming cells for IFN-γ, granzyme B, or perforin. (C) Cytotoxic activity of PBL from FL patients before and after in vitro culture for 14 d with autologous apoptotic lymphoma cell–loaded IFN-DC, as tested against autologous lymphoma cells and K562 target cell lines for 4 h at 37°C by Calcein-AM assay (upper panels). Data are mean ± SD of six experiments. *p ≤ 0.05, Mann–Whitney U test. Representative cytotoxicity assays from an HLA-A2+ patient, including additional results using Karpas-422 cells as target (lower panels). (D) Representative dot plot analysis of CD107a membrane exposure, as a marker of lytic protein degranulation, on CD8+ and NK cells derived from an HLA-A2+ FL patient in response to autologous lymphoma, Karpas-422, or K562 cells. Freshly purified PBL or PBL cultured with apoptotic tumor cell-loaded IFN-DC for 14 d were incubated with the indicated target cells in the presence of FITC-conjugated anti-CD107a Ab (see Materials and Methods) for 4 h at 37°C (E:T ratio of 2:1). Dot plot shows CD107a membrane exposure on CD8+CD56− (upper panels) or CD56+CD8− (lower panels) lymphocytes in response to target cells. One representative experiment of four with similar results is shown. (E) CLSM examinations of PBL/lymphoma cocultures. PBL were purified from FL patient blood donors (left panels) and cultured for 14 d with autologous apoptotic lymphoma cell–loaded IFN-DC (IFN-DC/APO; right panels). PBL were mixed with autologous lymphoma cells (E:T ratio of 2:1) and allowed to conjugate for 20 min. Cells were transferred onto poly-l-lysine–coated coverslips and stained with PE-conjugated anti-CD56 (upper panels) or anti-CD8 (lower panels) mAb, detected in red. Cells were then fixed, permeabilized, and stained for perforin detection (green). DAPI was used to stain nuclei (blue). These examples of CLSM analysis highlight the absence of cell conjugates when fresh PBL were mixed with autologous lymphoma cells and the formation of CD56+ or CD8+ cell conjugates (arrows) when PBL were stimulated by apoptotic lymphoma cell–loaded IFN-DC (right panels). Scale bars, 10 μm. One representative experiment of three is shown. 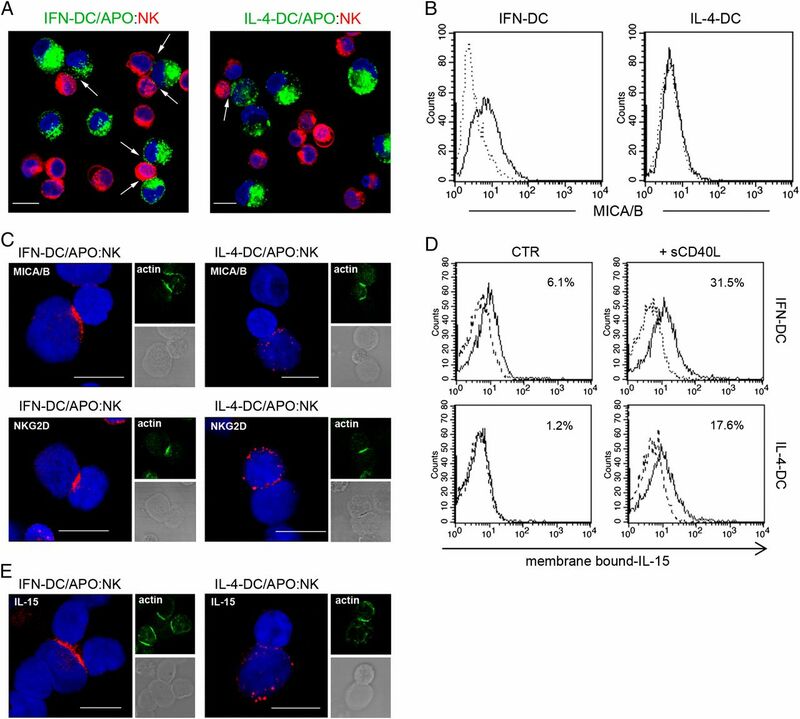 Conjugate formation and immunoregulatory synapses between apoptotic tumor cell–loaded IFN-DC and NK cells. (A) Representative examples of DC/NK cell conjugates by CLSM (three-dimensional reconstruction images). Apoptotic Karpas-422–loaded DC (green) and purified unstimulated NK cells (red) from healthy blood donors were prestained with PKH67 and PKH26 dyes, respectively (see Materials and Methods), allowed to conjugate for 20 min at a 2:1 DC/NK cell ratio, and fixed with 3% paraformaldehyde after seeding on coverglasses. DAPI was used to stain nuclei (blue). Arrows indicate DC/NK cell conjugates. Scale bars, 10 μm. Experiments were independently repeated three times with similar results. 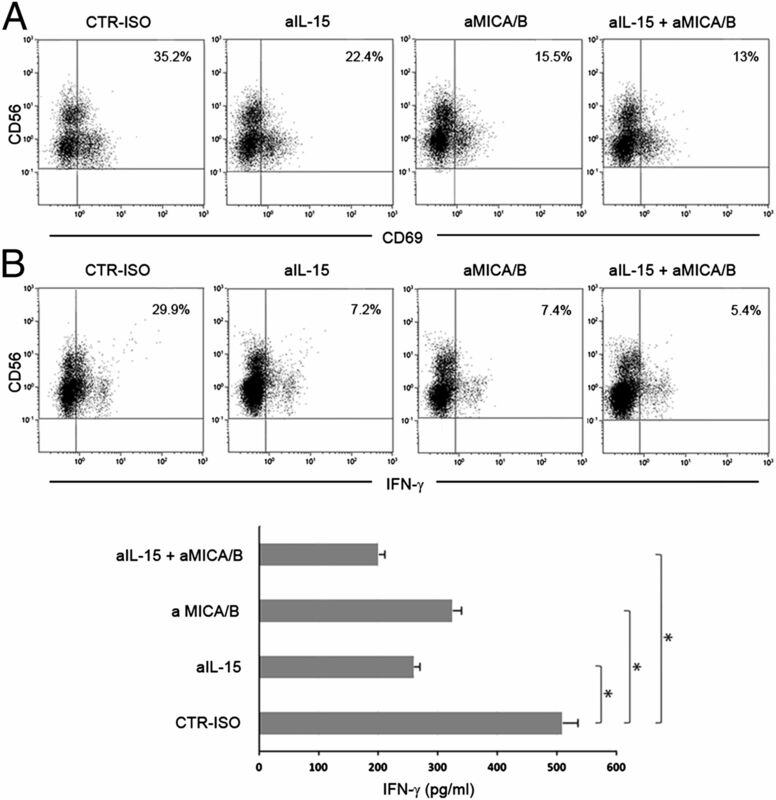 (B) Flow cytometric profiles of IFN-DC and IL-4–DC stained for MICA/B Ag. Dotted lines represent isotype-staining controls. Representative examples of three independent experiments are shown. (C) Distribution of MICA/B and NKG2D molecules in tumor cell–loaded DC conjugated with purified resting NK cells, as assessed by CLSM (three-dimensional reconstruction images). DC and resting NK cells were allowed to conjugate for 20 min at a 2:1 DC/NK cell ratio. Cells were then transferred onto poly-l-lysine–coated coverslips, fixed, permeabilized, and stained with anti-MICA/B or anti-NKG2D mAb (red), followed by Alexa Fluor 488–conjugated phalloidin (green) (left panels). Nuclei are blue (DAPI). Corresponding F-actin staining (green; upper right panels) and transmission light images (lower right panels) of the same cell conjugates, using F-actin polarization as positive control for functional regulatory synapses. Images are representative of four independent experiments. Scale bars, 10 μm. (D) Flow cytometric profiles of membrane-bound IL-15 expression on IFN-DC and IL-4–DC without prior activation (CTR) or stimulated by exposure to sCD40L for 18 h, as described in Materials and Methods. Dashed lines represent isotype-staining controls. Percentages of positive cells are indicated. Representative examples of three independent experiments are shown. (E) Distribution of IL-15 in tumor cell–loaded DC conjugated with resting NK cells, as assessed by CLSM (three-dimensional reconstruction images). DC and NK cells were allowed to conjugate for 1 min at a 2:1 DC/NK cell ratio. Cells were transferred onto poly-l-lysine–coated coverslips, fixed, permeabilized, and stained with anti–IL-15 mAb (red), followed by Alexa Fluor 488–conjugated phalloidin (green) (left panels). Corresponding F-actin staining (green; upper right panels) and transmission light images (lower right panels) of the same cell conjugates. Images are representative of five independent experiments. Effects of selective MICA/B and IL-15 neutralization on CD56+ NK cells from tumor cell–loaded IFN-DC/PBL cocultures. (A) Flow cytometric analysis of CD69 expression level in electronically gated CD56+CD3− cells from PBL cocultured for 7 d with apoptotic Karpas-422–loaded IFN-DC in the presence of anti-MICA/B or anti–IL-15 blocking Ab, used alone or in combination, as described in Materials and Methods. Percentages of positive cells are indicated. Representative dot plot of three independent experiments. (B) Representative dot plot analysis (of three) of IFN-γ intracellular staining in electronically gated CD56+CD3− NK cells of PBL cultured for 7 d with apoptotic tumor cell–loaded IFN-DC in the presence of blocking Ab or mixture, as indicated (see Materials and Methods) (upper panels). Cells were stained for CD3 and CD56 Ag, fixed, permeabilized, and stained for intracellular IFN-γ before FACS analysis. The effect of selective MICA/B and IL-15 neutralization on IFN-γ secretion was also tested by ELISA assay in the culture supernatants of IFN-DC/PBL cocultures at day 7 (lower panel). *p ≤ 0.05, Mann–Whitney U test.